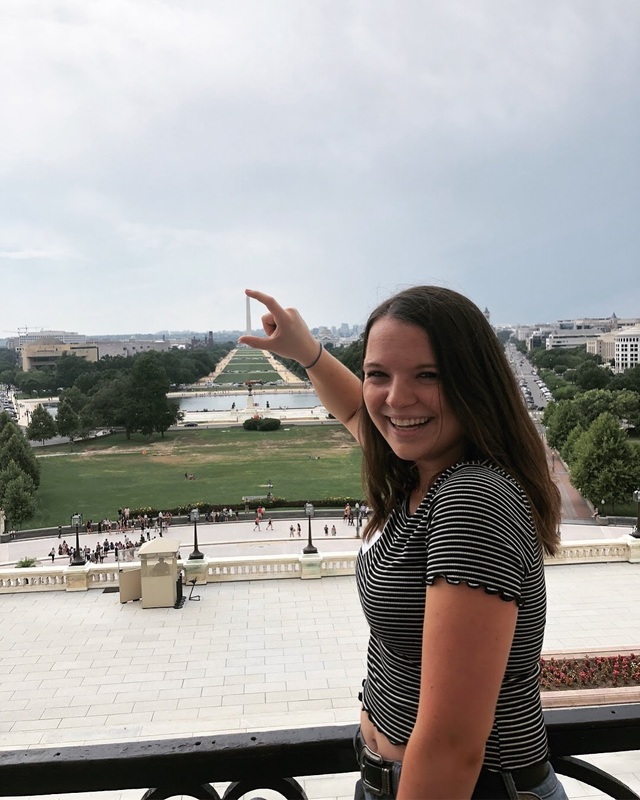 Changemaker Catalyst Award recipient Victoria Rose spent this past summer interning with Planned Parenthood in Washington, DC. Rose is a rising Junior at Tulane University, majoring in Public Health and Mathematics, with a minor in Engineering. She is currently involved on campus through her job as a Makerspace Ninja, Chi Omega Sorority, and Tulane’s Improve Group, Unscripted. 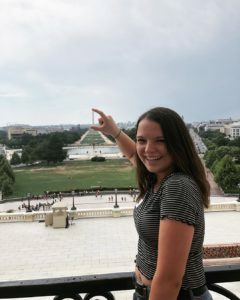 Victoria Rose, standing on the balcony of the capital building in front of the Washington Monument. 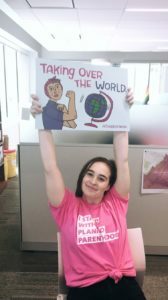 Planned Parenthood gave me the opportunity to combine my knowledge of computer coding and statistical analysis with the implementation of public policy, to assist the organization with daily logistical tasks. This internship additionally allowed me to enhance my public speaking and outreach skills, by allowing me to immerse myself in the community for various outreach events. Victoria Rose (bottom right) and some of the PPMW staff at a rally in front of the Supreme Court. 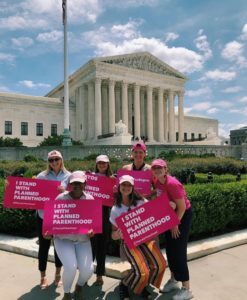 Only two weeks into my internship, I had already marched with Planned Parenthood, attended a conference with influential politicians, and built strong relationships within my organization. I also had the opportunity to put together, and ship off, Birth Control Educator Kits to schools and educational facilities across the country, in order to promote family planning and safe sexual practices. The thing I loved most about my internship was that it was a warm, welcoming, and inviting work environment for every single person who walked through the door. I felt immediately accepted by each new face, which made the first few weeks go by in a wonderfully natural way. My supervisors continuously gave me projects of increasing importance, and I learned to predict what needed to get done, and in what order to approach tasks, in order for things to run smoothly. My boss was so incredible, and has turned into an excellent mentor for me. I am thankful every day that I had the pleasure of working with such a fantastic woman. 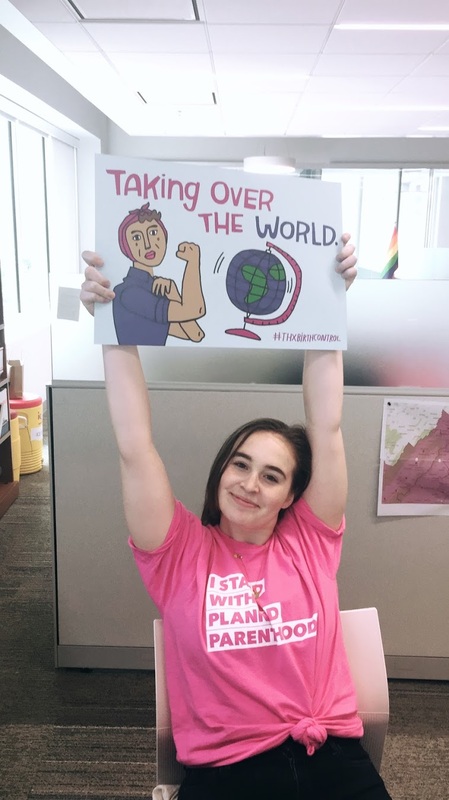 Intern Hannah Wright showing her Planned Parenthood Pride! I was fortunate enough to meet Planned Parenthood’s CEO, and to have a delightful interaction with her, which only solidified my love for the internship. She made it a priority to get to know everyone in the office, even the interns, who were only around for the summer, like me. I have learned from her that everyone’s job matters, and I am humbled by how she outwardly appreciates everyone who works for her, and treats them with respect, no matter who they are. Planned Parenthood has strengthened my leadership skills in ways I could have only imagined. We got new volunteers every week, and I was usually in charge of delegating tasks for them, as well as showing them how we do things in our day to day work. These tasks could be building Birth Control Educator Kits, tabling at an event, giving out swag, or rallying at the Supreme Court. By working with such an influential organization, I felt empowered every single day, and was continuously reminded of how beautiful it is to be a woman. There was a time when women couldn’t vote, work, or own anything for themselves, and although we still have a ways to go in our fight toward equality, it has been a beautiful and empowering journey. I can only look back and hope that I can continue the work that the women of the 1920s started, so they would be proud of all that women have accomplished.